Made with real and good quality ingredients such as pasteurised eggs, vinegar, soybean oil, pickled relish and mustard. 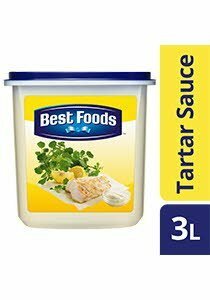 Best Foods Tartar Sauce complements seafood well. Its thick and creamy consistency also makes it ideal as a dipping sauce for fried foods such as potato wedges, calamari and onion rings. All additives are of plant and synthetic origin. May contain traces of cereals containing gluten, soy, fish, and milk.